Carol and Wendell: Thank you so very much for the amazing time spent with you. The apartment was comfortable, clean, and really perfect for our needs. We so enjoyed spending the time with you and the cooking instructions! You are kind and lovely people and we thank you for everything. We hope to see you again in the next year. to next guests: The setting is exquisite with views that are unsurpassed. The apartment was perfect, clean, spacious, comfortable. We could not have asked for a more perfect location to spend our time in Tuscany. The people are kind and helpful, Daniela is a dear and so very helpful. You could not find a better place to spend time and experience the Tuscan sun. The location is great for travel in the area, very close to other towns and to Florence. Overall, an A++++ rating we will be back! Monique and Louis: Thank you very much for a fantastic holiday. We loved our appartment at La Rocca and we will certainly rent again when we are back in the region. A special thank you to Daniela who was very patient waiting for our late arrival and helping us settle in. Your establishment is really First Class. to next guests: A very nice and comfortable appartment with a stunning view over the valley toward Quarrata and Pistoia. The location itself is excellent as a starting point to visit the Lucca / Pistoia / Firenze area or the wine country around Vinci. Riding the train to Lucca (a little known gem) or Firenze is the best way to visit, but you **will** need a car to get to the train station (at Pistoia or Prato) or to roam about the Montalbano region. Daniela was very helpful and pleasant getting us settled in. (Also very patient with us : getting to Buriano after nightfall is an adventure in itself!). 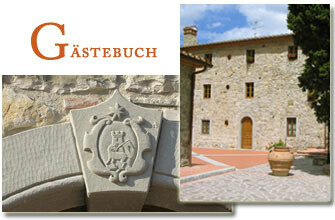 All in all, we had a wonderful time at La Rocca del Maestrino and hope to be back soon. Aylsa & Darren: Thank you so much for organising such a wonderful wedding and stay at La Rocca.The accommodation and views were better than we had ever imagined. The pictures in the brochure just didn´t do it justice. All our family and friends had an amazing time and nothing was too much trouble. Thanks to Daniela for getting us settled in and helping out with all the little queries and a special thanks to Elena for her patience and understanding and for dlivering a very special wedding. We hope to be back to celebrate our anniversary at some point soon. to next guests: What a fantastic place! The views accross the Montalbano hills were amazing and it was such a peaceful and beautiful place to retreat and to get married. The pictures just didn´t do it justice. The accommodation was charming and typically Tuscan. The location is ideal to visit the main Cities and you are only 10 mins drive from Quarrata but you do need a car to get around. We will definietly be back to soak up the Tuscan sun on our anniversary!